Rêves d’été (aka Summer Dreams) is the last pattern I published on June 20th, for summer, in partnership with Cécile La Fée Fil. 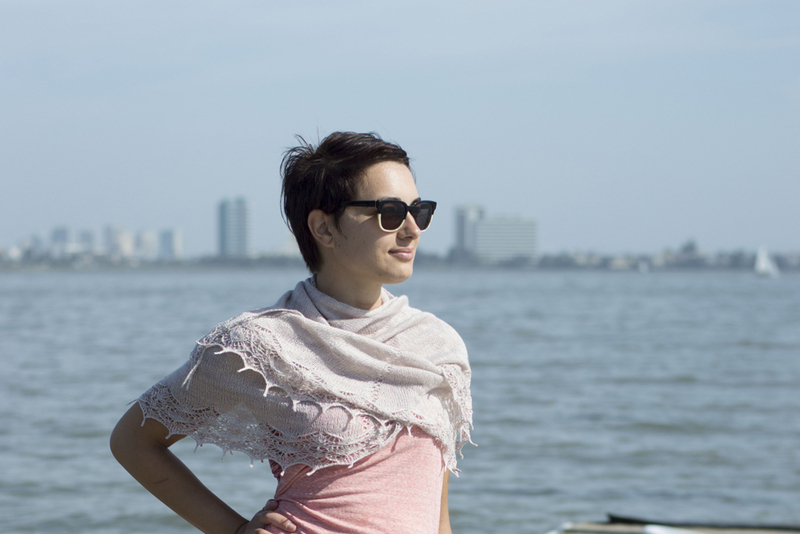 I wanted to create a circular shawl in overall lace and I wanted to take the pictures on the beach, by sunset. I had planned my holidays at the beach to make it. But it didn’t work out ! I just couldn’t make it. There always was somethign that didn’t feel right in the lace. After many trials, I followed a friend advice and decided to put it aside and let it rest until I found the perfect idea. And it came, just really much later thant I expected : not a circular shawl, but a crescent one, not in overall lace, but in stockinette, with a lace border and beads… I finnally finished it ! The result of all those changes gives a light airy shawl, elegant adn refined, working great on the beach by sunset or at every summer parties. Rêves d’été is crescent shawl, worked from center outward. The major part of the shawl is worked in stockinette and isn’t difficult to make. You will need to pay more attention and be meticulouss to work the delicate beaded lace border, since lace is worked on every row, but the result is worth it ! Beads are added one by one in the lace border while you knit it.